Many bedwetters suffer from low self-esteem and a lack of self-confidence. And given the fact that they think they’ll be stuck with this problem for the rest of their lives, who can blame them? Being a child who wets their bed is no fun. Bedwetting, also known as enuresis, is a very common problem for many kids over the age of 4. It’s a difficult time for children of this age group as they’re entering school and have all sorts of stressors to worry about. While many cases of enuresis are caused by physical problems, anxiety is also a possible reason for nighttime accidents. Children who suffer from enuresis don’t want their friends to find out about their problem, so sleepover’s and other play dates become a problem whether at home or a friend’s house. It’s important that we as parents deal with it carefully. Start building confidence by keeping their sleeping area dry. 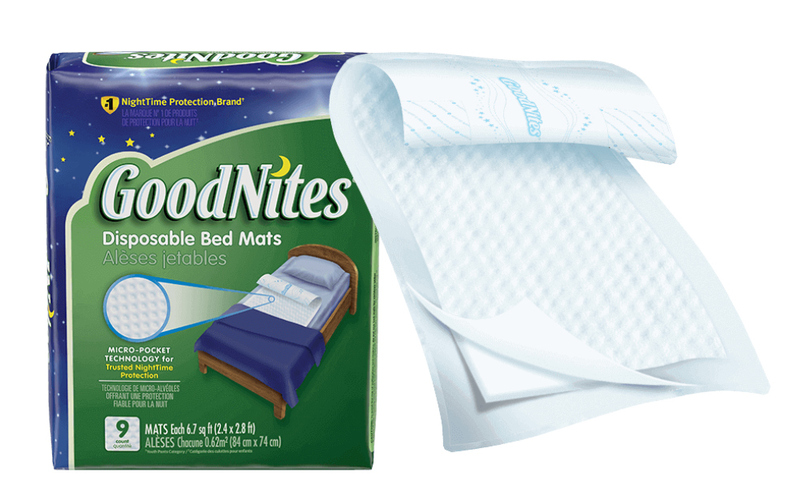 GoodNites® disposable Bed Mats are a good tool to try, as it prevents the entire bed from getting wet and minimizes the cleanup process. A smaller mess means less to worry about. Don’t forget that part of what makes wetting the bed so scary is the fear of disappointing mommy or daddy. When my daughter had problems with enuresis, rather than wake me up and risk me being upset, she slept in the wet bed all night. I had to reassure her it was just an accident – I knew she didn’t wet the bed on purpose. Reassure them with the knowledge that most children outgrow this problem by the time they hit their teens. Reinforce what you are trying to help them accomplish by creating a nightly bedtime routine. Practice waking up and going to the bathroom before they go to bed, so when they ‘feel it’, they’ll know what to do. Most importantly, remind your child how proud you are when they have made it through the night whether they had an accident or not. Knowing how proud mommy and daddy are will help maintain a positive attitude.